in Ethiopia! The premier also explained other wide range of questions including extremist fanned bogus issues that we the Diaspora’s are used hearing. Apparently ETV found some of the issues like... was the dam planned to thwart an Arab like revolution and was the dam the work of earlier governments! We think the premier should not be dragged to address extremist questions but Thank you ETV! Poem on the occasion of Hedase Dam! Recently, it has been quite common for reports from international organizations to detail the way Ethiopia since 1991 has embarked on its ambitious transition to a democratic state under the leadership of the Ethiopian People’s Revolutionary Democratic Front (EPRDF). 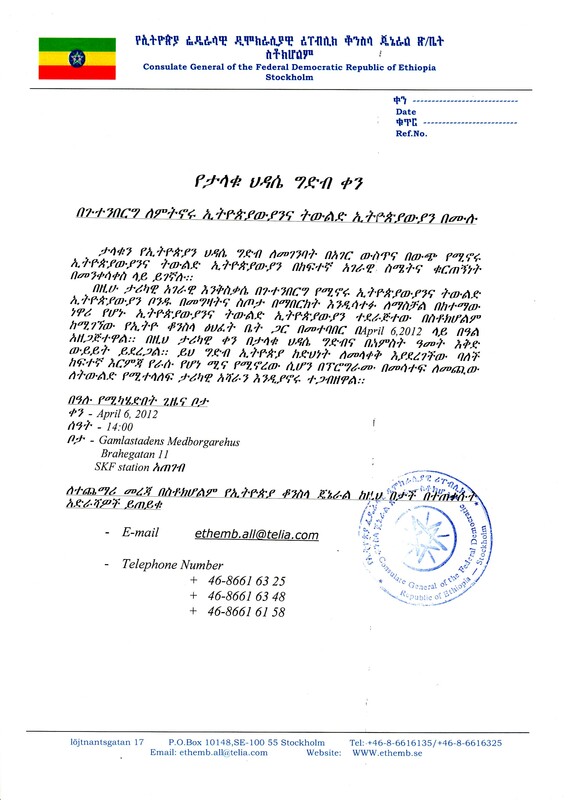 ‹‹ሰው ነፃ ሆኖ ማሰብ ከቻለ ማንኛውንም ነገር መሥራት ይችላል›› ወጣት እስራኤል ቤለማ ፣ ኮምፒውተር ኢንጂነር . ከሰለሞን አጎናፍር-- በሳምንቱ የእረፍት ቀናት በሆኑት ቅዳሜና እሁድ አራት ኪሎና አምስት ኪሎ አካባቢ የሚገኙ ካፌዎች በረንዳ ላይ ቁጭ ብዬ ቡናዬን ፉት እያልኩ አዟሪዎች እጅ ላይ የማገኛቸውን ጋዜጦች በመግዛት ማንበብን እንደ ልማድ ካደረጉት አመታትን አስቆጥሬያለሁ ፡፡ . By Teshome D. Birara (A.A.U) Marc 30, 2012-- Peace and security are vital prerequisites for the realization of sustainable development in any nation. Cognizant of this, the Ethiopian government stipulates in its foreign policy as development is only possible through strengthening peace and security not only locally but globally as well. ADDIS ABABA, 30 March 2012 (IRIN) - Late and erratic mid-February to May (`Belg') rains could significantly reduce crop yields in central and southern Ethiopia and adversely affect food security, warn officials. ADDIS ABABA, March 29 (Reuters) - Ethiopia has accepted bids worth 2.1 billion birr ($121 million) for seven state-owned firms, part of a plan to privatise dozens of corporations in the next three years, it said on Thursday. 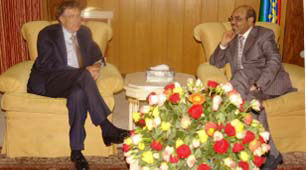 Addis Ababa, March 28, 2012 (Addis Ababa) - Prime Minister Meles Zenawi here on Wednesday held talks with a delegation led by Bill Gates founder and co-chair of Bill and Melinda Gates Foundation. የአስመራው ቡድን ዛሬም “በአዞ እንባ” ስልት? “በሃይማኖታዊ ግርዶሽ” ፖለቲካዊ ጥያቄን ማንሳት ይቻላልን? 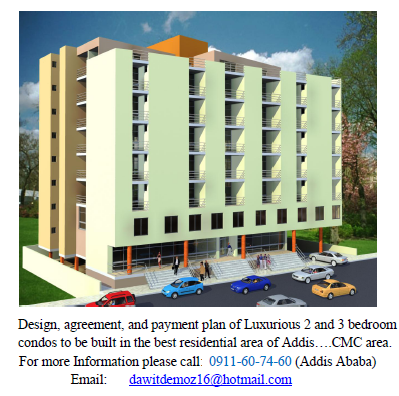 በተቀባዩ ዘንድ ዋጋ የማይሰጠው ይቅርታ ለህግ የበላይነት ጠንቅ ነው! Monthly Publication from the Ethiopian Embassy in London Ethiopian News. Eritrea's Duplicity of Playing the Victim Card! Eritrea cries to the UN Ethiopia has hit terrorist camp deep in its territory. Members of the Ethiopian-Somali Community in the UK buy bonds worth 7.18 million Birr.